On January 20-24 Team iW will report live from Geneva at the Salon International de la Haute Horlogerie Genève, (the SIHH). The annual exhibit features the latest debuts from A. Lange & Söhne, Audemars Piguet, Baume & Mercier, Cartier, Greubel Forsey, IWC, Jaeger-LeCoultre, Montblanc, Panerai, Parmigiani, Piaget, Ralph Lauren, Richard Mille, Roger Dubuis, Van Cleef & Arpels and Vacheron Constantin. 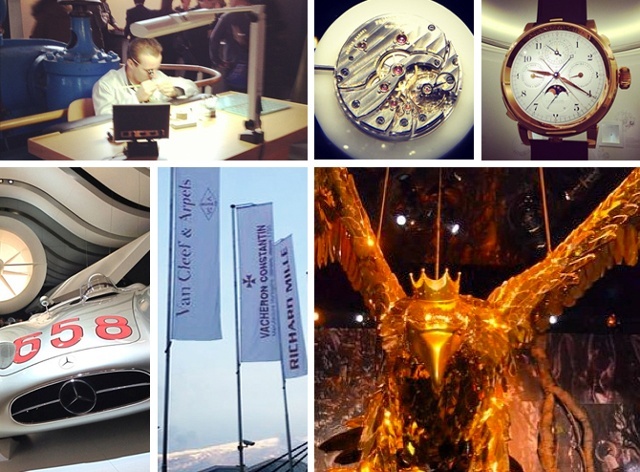 For live coverage of the SIHH, follow iW on Twitter @iwmagazine, Instagram @iwmagazine and Facebook. Stop by iWMagazine.com as well iW’s FlipBoard channel for up-to-date news and exclusive video coverage throughout the week. Traveling to Geneva? Be sure to tag your photos with @iwmagazine and use the hashtag #iwseenspottedgeneva for a chance to be featured in upcoming issues of iW, iWMagazine.com and across iW’s social media platforms. Complexities of all stripes marked much of the remaining debuts seen at SIHH 2013. Several brands focused their attention on complicated movements while others presented stunning and labor-intensive dials and unusually constructed cases. Grand Complications were seen at Audemars Piguet and A. Lange & Söhne. The white gold and titanium Audemars Piguet Tradition Tourbillon Minute Repeater is an almost retro-looking ten-piece whose impact was blunted a bit by the firm’s new Grand Complication, an extremely limited edition in the Royal Oak Offshore family that features a split-seconds chronograph, minute repeater, tourbillon and a perpetual calendar—all packed into a 44 mm titanium case…continue reading.